“I create vibrant fine art for small spaces and eye-catching accessories to wear. “I have chosen the mandala imagery for its sacred symbolism, balance and harmony. Each piece celebrates our deep connection to nature and the feelings we embody while immersed in it. I invite you to notice which pieces evoke that experience for you. Tricia is a native of California residing in Nevada County. She has taught art and fine crafts for many organizations throughout her career as an artist. 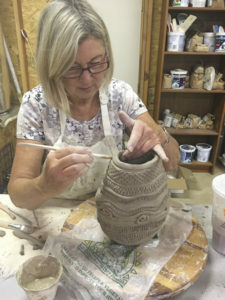 She is originally from Southern California where she owned an art and craft store where “teaching others to find their own creative expression” was her passion. Her work can be seen in various fine gift stores and galleries as well as popular juried art shows in Nevada and El Dorado Counties.